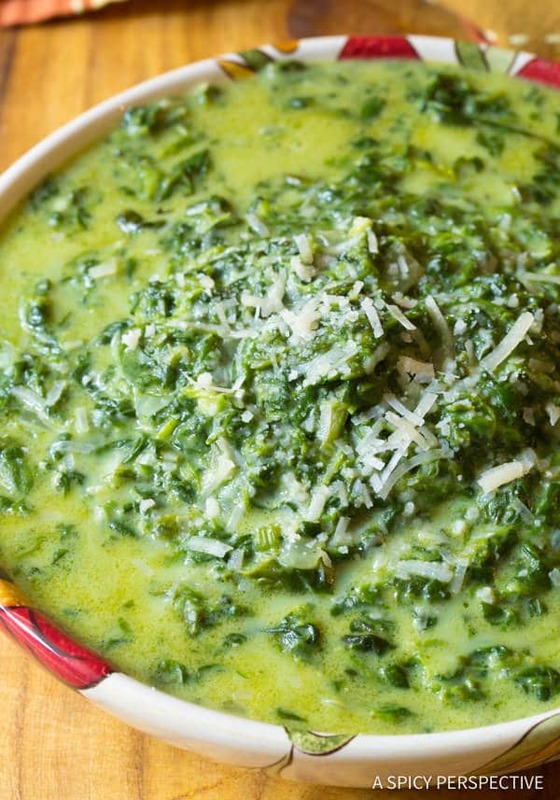 We’re sharing The Best Creamed Spinach Recipe we’ve ever made! A wonderful green side dish for the holidays. These two words tend to have a strong impact on most people. Either a cringe effect, or a sigh of cozy nostalgia. Today I’m serving up The Best Cream Spinach Recipe, in my humble opinion. 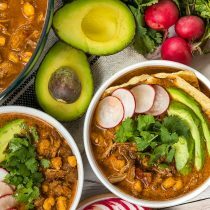 It’s easy to make, either quickly on the stovetop or simmering all day long in a crockpot. This recipe offers a vibrant grassy note with nutty parmesan, garlic, and spice. The texture is rich and luxurious. This is the perfect way to eat spinach in the cooler months. I think even the most resistant spinach eater might have a change of heart after tasting this creamed spinach! When I’m in a hurry I make it on the stovetop in less than 20 minutes. However for big celebration meals, when I need all my burners for other dishes, I start The Best Creamed Spinach Recipe in the slow cooker and let it simmer all day. 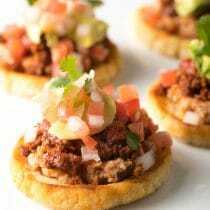 It tastes amazing and rounds out comforting meals and holiday feasts, with mostly brown foods. 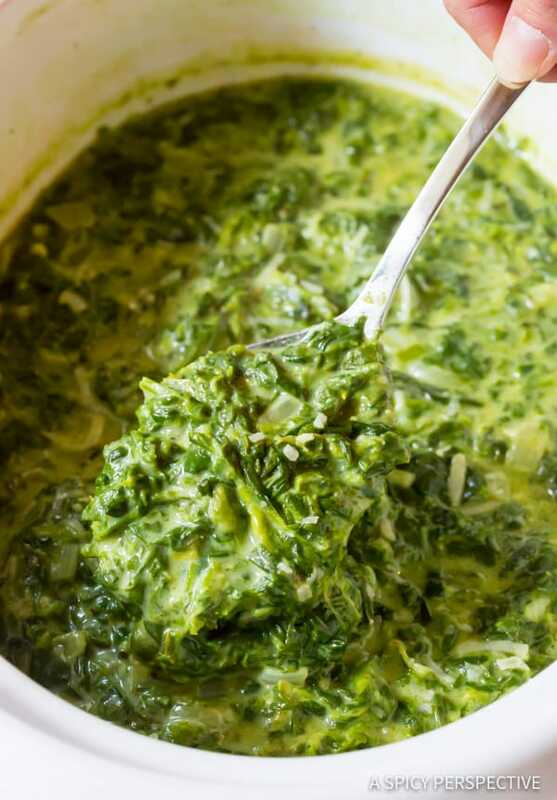 If you are someone who can’t serve a meal without a green vegetable, The Best Creamed Spinach Recipe is a true winner. Forget the green salad that will, no doubt, be overshadowed on the Thanksgiving and Christmas table. This year serve creamed spinach along with your sweet potatoes, mashed potatoes, Thanksgiving stuffing and ham. You’re family will thank you! Sauté – Take the time to cook the chopped onions and garlic in a skillet before adding them to the slow cooker. Although your onions will cook in a crockpot, they often end up with a rubbery texture and metallic taste. Dump – Scoop the onion mixture into the crock, along with the frozen spinach, milk, salt, nutmeg, white pepper and cayenne pepper. Cover and turn on low. 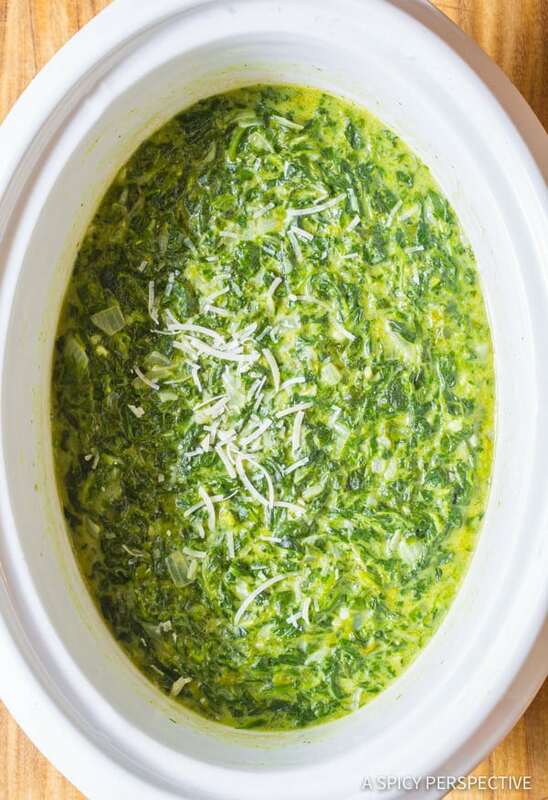 Slow Cook – Slow cook The Best Creamed Spinach Recipe for 8-10 hours until the mixture simmers and thickens. Make sure to stir it every few hours so it doesn’t stick to the bottom. Is The Best Creamed Spinach Recipe gluten free? No, but you can easily adjust it to be a gluten free recipe. Just substitute rice flour for the all-purpose flour. How do you make a dairy free version? Substitute thick canned coconut milk for the milk and vegan butter for the butter. Is The Best Creamed Spinach Recipe ketogenic? No. However, if you removed the flour altogether, if would be. 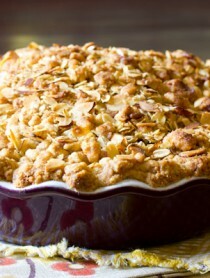 Substitute cream for the milk to provide extra fat, and a rich luxurious texture. 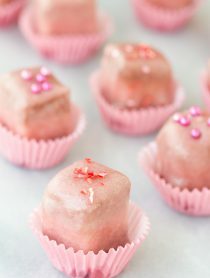 Can you make this recipe ahead of time? Yes, you can make creamed spinach up to three days before servings. 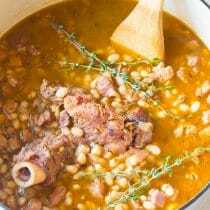 Rewarm in a crockpot or on the stovetop. Can you freeze this recipe? Yes. Just make sure to thaw it slowly at room temperature before rewarming. The Best Creamed Spinach Recipe - A fabulous Stovetop or Slow Cooker Creamed Spinach Recipe that pairs well with comforting holiday meals. Place the butter, chopped onions, and garlic in a skillet. Set over medium heat and sauté to soften, about 3-5 minutes. Stir in the flour and stir well to break up the clumps. 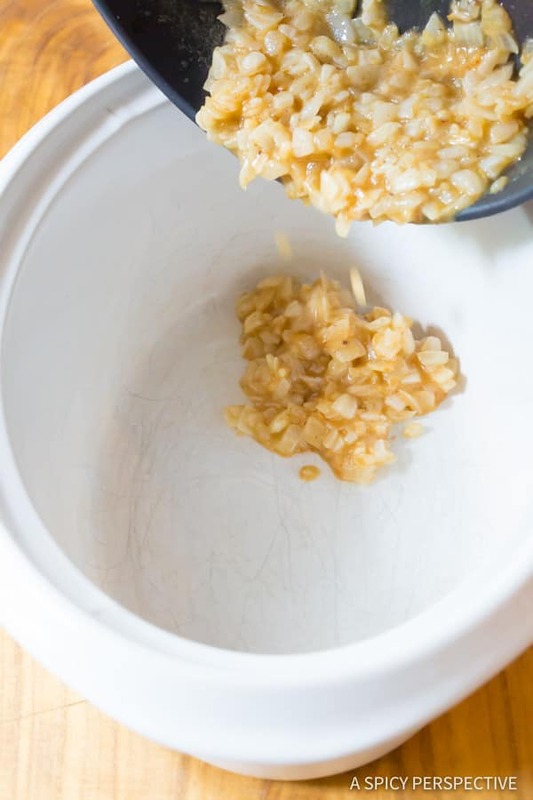 Scoop the onion mixture into the crock of a large slow cooker. Add the frozen spinach, milk, salt, nutmeg, white pepper and cayenne pepper. Cover and turn on low. Slow cook for 8-10 hours until the mixture simmers and thickens. Stir every few hours. When ready to serve, stir in the Parmesan cheese. Serve warm. Stovetop Instructions: Cook the onions and garlic in butter as directed above, but do so in a large deep saute pan. Add additional ingredients to the saute pan (Step 2) and bring to a simmer. Simmer for 15-20 minutes, stirring occasionally, to thicken. Stir in the Parmesan cheese and enjoy! Another question. What would be the effect if I swapped the milk for heavy whipping cream? 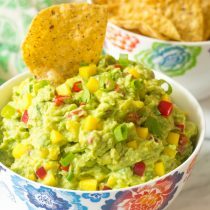 How would it change the cooking time in the crock pot if I don’t use frozen spinach, but instead use fresh? It should cook in about half the time if the spinach is fresh. Looks too good! Can I use fresh spinach? If yes, what would be the equivalent amount? Absolutely! You will still need to use 36 ounces of spinach, it will overflow the pot at first but will cook down quickly. I loooove cream spinach! What size crock pot did you use in the picture? I’m just wondering if I’d be able to use by 9×13 casserole crock pot without it over flowing. Also in the pictures, it looks a little soupy. Do you think if I let the spinach thaw a little and squeeze out some water it’d make it less soupy or too dry? What if I only used 1/2 a stick of butter to cut down on the fat? I used a 6 quart slow cooker. 9 X 13 inch pans are about 3 quarts. So even though the crock isn’t full to the top, I think you might need a larger pan. You can squeeze out the liquid if you like, but the spinach does firm up a little as it cools. As for butter, feel free to adjust to your liking. Happy Cooking! This recipe looks great. Would you have the same results if you left off the flour? Thanks! If you take out the flour, you might want to substitute something like cornstarch or arrow root powder as a thickener. So good! does the recipe change at all if I use fresh spinach. I’m wondering if I am doing something wrong, my milk to spinach ratio seems off. Should the spinach be covered in the crockpot or mostly exposed? This spinach is so tempting!!! I have never had creamed spinach (isn’t that funny?!) but this looks really good! Anytime the crockpot can do the work for me I’m in! 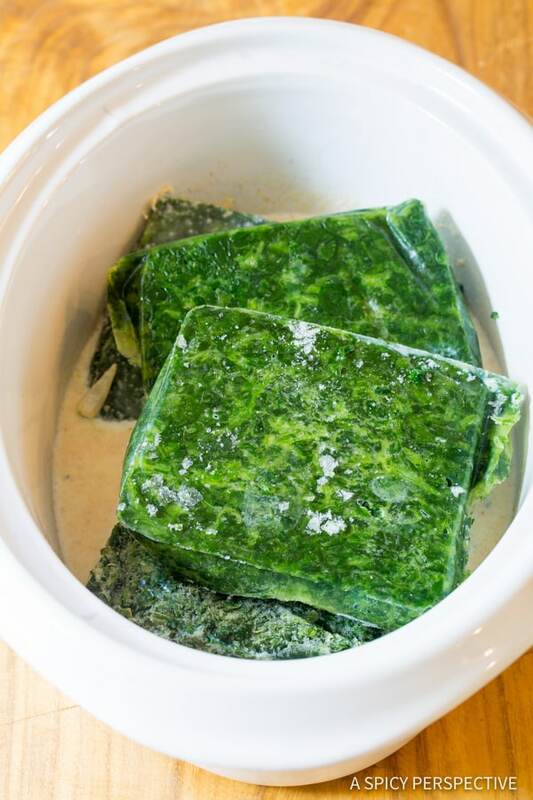 Do you thaw the frozen spinach before adding to the crockpot? Yum! Pinning for Thanksgiving! 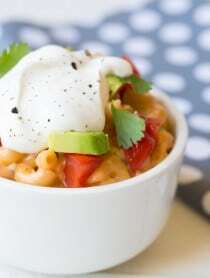 Love that you can throw it in the crock pot and forget about it till dinner.